International Olympic Committee (IOC) President Thomas Bach says he has confidence that Russian authorities will deliver a “safe and secure” Winter Games in Sochi in February 2014. Thomas Bach wrote to President Vladimir Putin to express condolences for the “despicable” attacks that struck Volgograd within 24 hours. Investigators say the attacks on a railway station and trolleybus, which killed at least 31 people, were linked. They struck just over a month before the Winter Olympics begin. Volgograd was also targeted in October, when a suspected female suicide bomber killed six people in an attack on a bus. It is being widely assumed in Russia that the people who carried out the Volgograd bombings were involved in the Islamist-inspired insurgency against Russian rule in the Caucasus republics of Chechnya and Dagestan, and that the target was the Games. In a statement, Russia’s foreign ministry did not blame any particular group but likened the attacks to acts by militants in the US, Syria and elsewhere. It called for international solidarity in the fight against “an insidious enemy that can only be defeated together”, reported Reuters news agency. Regional Governor Sergei Bozhenov said the bombings were a “serious test” for all Volgograd residents and all Russians. 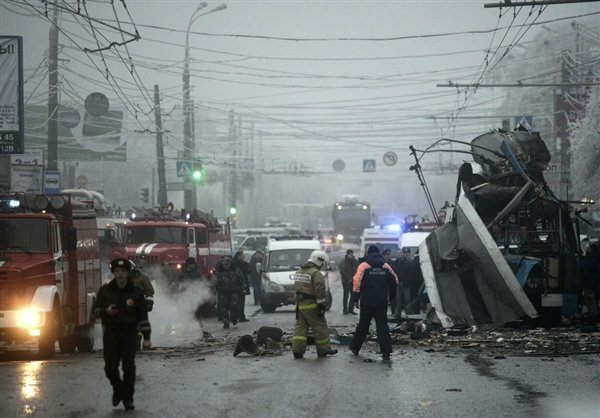 Investigators say at least 14 people were killed in a suicide bombing on a trolleybus in Volgograd on Monday morning. It came a day after 17 people died in another suicide attack at the central station in the city. Scores were injured in the two attacks. In his statement, Thomas Bach said he was “certain that everything will be done to ensure the security of the athletes and all the participants of the Olympic Games”, which open on February 7. But correspondents say despite intense security in Sochi, Russians are palpably nervous that following these attacks in Volgograd – which lies 700 km north-east of Sochi – bombers could also strike elsewhere. No-one has admitted carrying out either bombing, but they came several months after Chechen rebel leader Doku Umarov threatened new attacks against civilian targets in Russia, including the Olympics. Vladimir Markin, a spokesman for the Investigative Committee – Russia’s main federal investigating authority – said identical explosives were used in the two attacks. “This confirms the theory that the two attacks are linked. It is possible that they were prepared in the same place,” he said. President Vladimir Putin has ordered security measures to be tightened across Russia and in particular in Volgograd. The US condemned the attacks and offered its “full support to the Russian government in security preparations for the Sochi Olympic Games”.